Another site I visit, frequently, for his lovely loose rendering in line and continuous line is Antsketch. Thank-you for your drawings. I saw a robin on Saturday. He was dining on some fruit from my flowering pear tree. 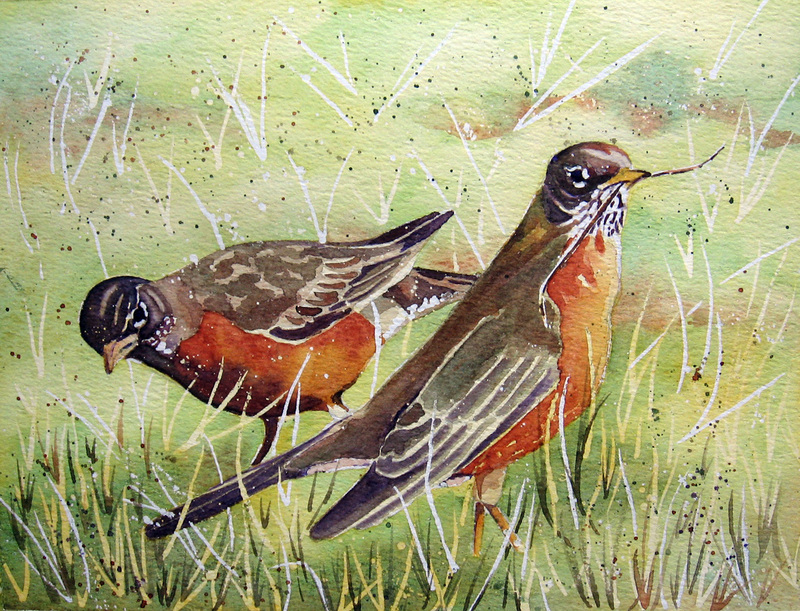 I was totally under the assumption that robins migrate and that their return heralds the arrival of spring. Well, I guess not. I googled robin and found that they can and are often here year round. The difference is that they are not hopping around on our lawns looking for worms and insects, but in the thickets and pine trees and feeding off the fruit of fruit bearing trees and shrubs. The one I saw followed this plan to a tee. He fed and flew off not once touching ground. So, I guess spring will arrive when we see them once again hopping around on the ground and not feeding in trees. I’m still experimenting with the limited palette listed on the previous post. 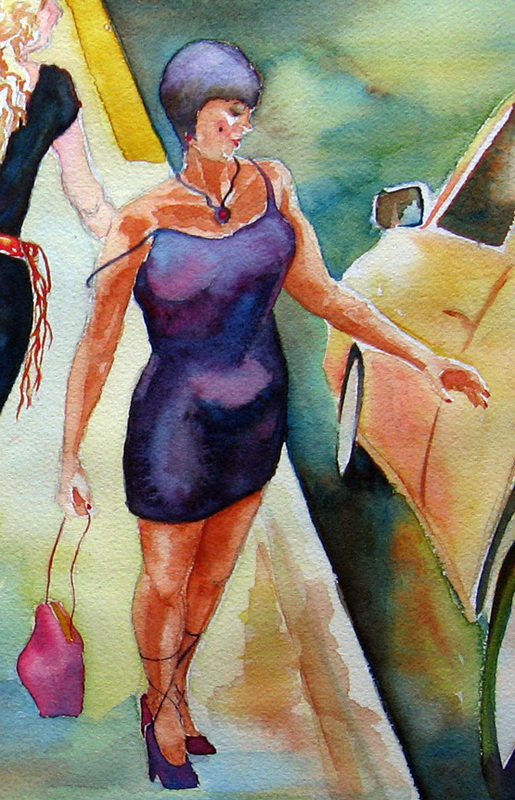 For this one, I used burnt sienna, transparent yellow, winsor green (blue shade), and diox violet. I tried a new paper. This is on 300 lb saunders waterford cold press. Nice paper for detail work. 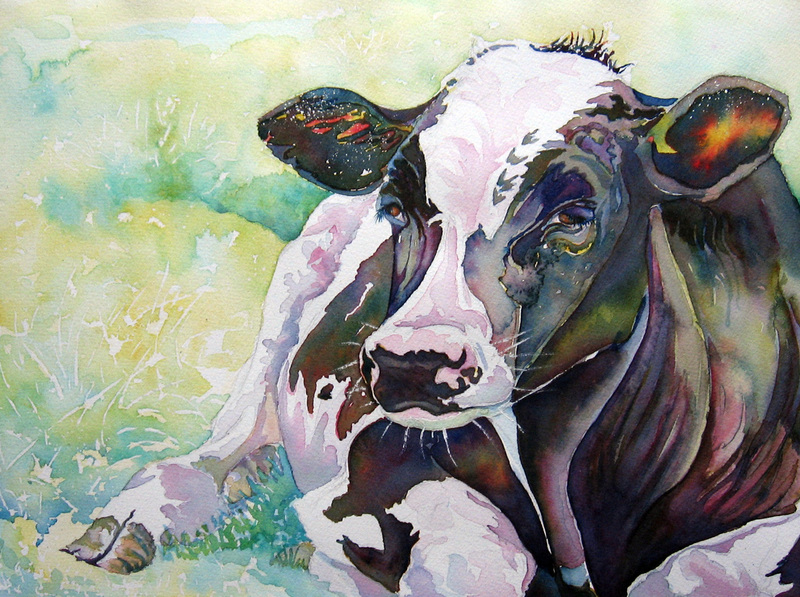 I have always wanted to spend some time painting cows. Don’t know why. 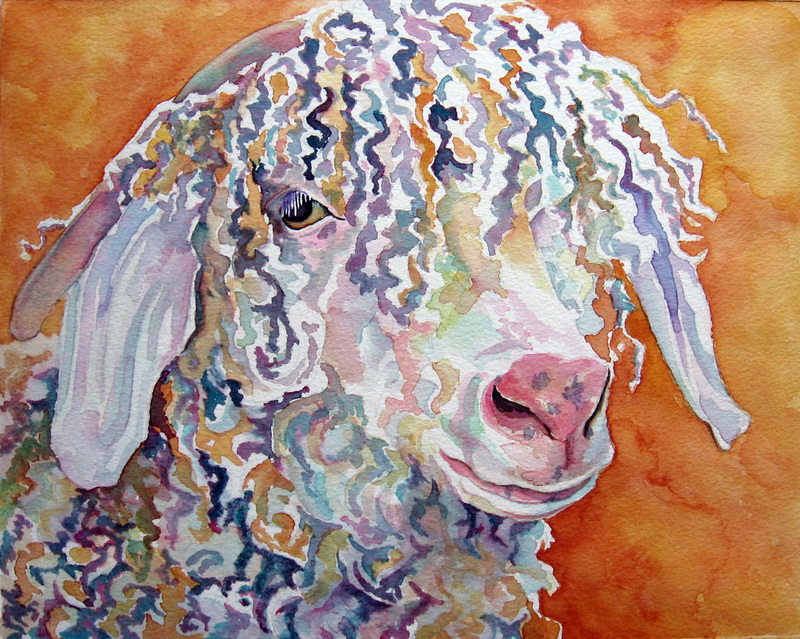 Perhaps it is that I am happiest when painting animals. This lovely lady lives to the east of me. Every so often I drive out in the country east of here hoping to snap a picture of the Amish and the teams of horses. They are always too far off for my camera capabilities. This Holstein, however, was very near the fence and didn’t budge when I got out of the car. Such luck! Two weeks ago I visited Eva’s blog and found this poem titled “1:37am sleepless”. I was impressed and commented because it brought sights and sounds and movement alive for me through the way she worded it. I am not a writer but have taken an interest in what a few writers are doing so I follow them. To make a long story short, Eva replied to my comment asking if I would try to illustrate her poem. The above is my attempt to do so. Let me say, right up front, that I am not an illustrator. 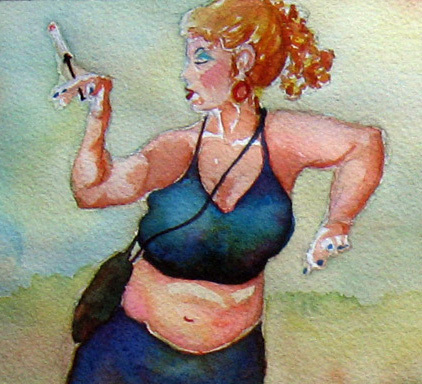 I rely heavily on what I see to create a drawing or painting. In preparation for this painting, I drew numerous figures. I had some figure drawings from my sessions of life drawing and I have several figure books. I had to come up with figures I saw in my mind when I read her poem so some of these have been fattened up. Two have tops from one pose and legs from another. I actually got the lady looking over her shoulder from turning and staring at myself in the mirror to see how my body twisted and how much of the side of her head I’d need to include. The yellow taxi that seems to be soaring in for a landing (incorrect perspective on that) happens to be what my Jetta looks like as I stare down its’ side from behind. OK, the pre-drawings were done. Next I decided how I wanted to lay it out. I hope I captured a viewpoint a little above the street. I chose to overlap the women leading one’s eye across the page in a serpentine manner and including a post in the background. The light source isn’t defined in the hopes that the yellow casts all around would suggest street lamplight. 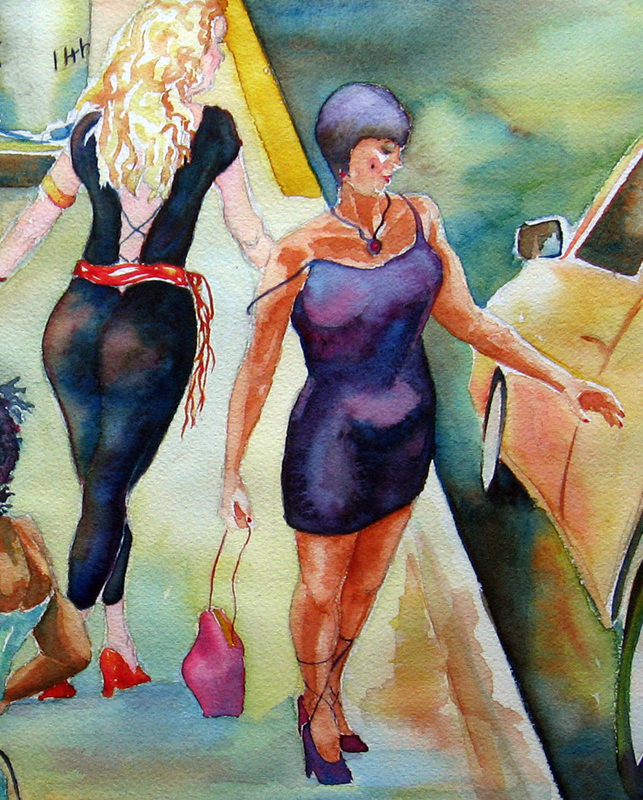 I tried to capture sadness in the little blonde woman in the foreground, the energy of the smoker swirling her cigarette in the background, the clicking of heels with the blonde walking away and the taxi pick-ups with the woman reaching for the back door of the taxi starting to open for her. 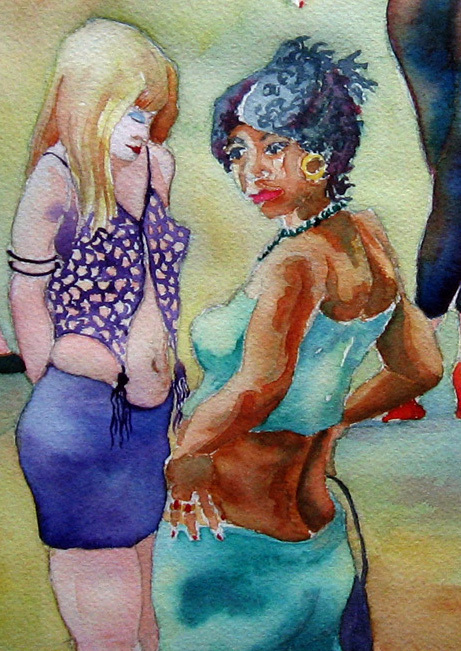 I tried to develop the personality of a lady of the evening in the facial expression of the foreground lady in green. 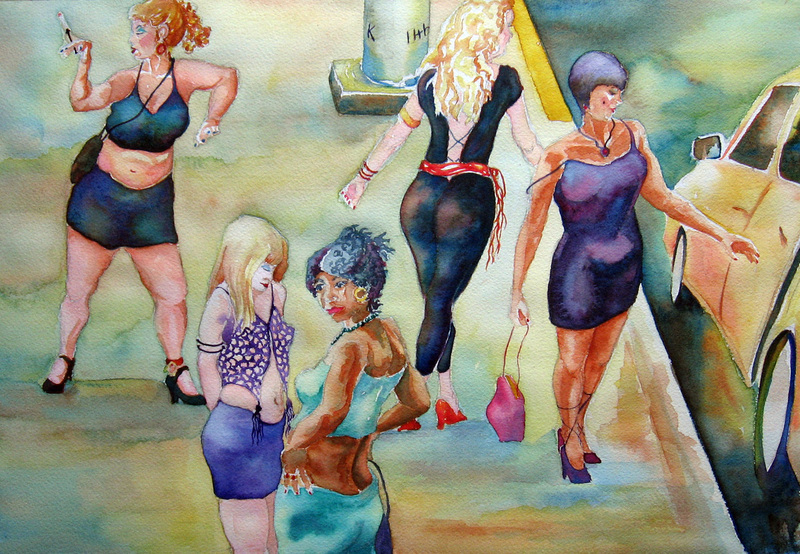 I realised how little of streetlife I knew as I painted this. I’ve only seen these women featured in police documentaries on TV or seen fleeting pictures in photo magazines that accomplished photographers have taken. This is pretty much the vision I had when I read Eva’s poem. There are things I wish I had done better and they would include more lost edges, more abstract look and a darker and more somber scene. Next time! There is always something we wish we had captured a little better. Below are mini’s cropped from the above painting. I thought they were interesting. Click any of the images to enlarge. My daughter walked in one morning and saw this painting in progress. She commented that it looked like a place in Lord of the Rings. 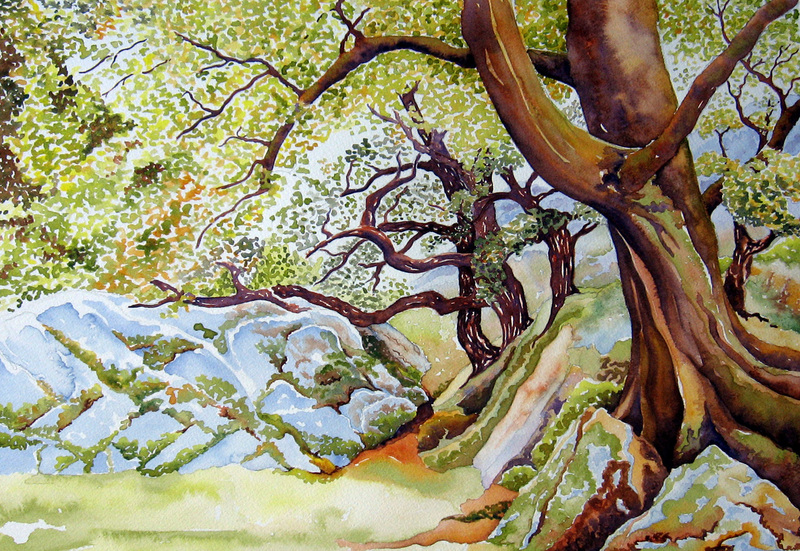 People on Wet Canvas had commented that the reference photo looked like where the gnomes and fairies play. When I first saw it, I had a totally different thought. I read a book quite a few years ago titled The Education of Little Tree. In the book, the grandmother told Little Tree (the little boy) that everyone needed a special and secret place where they could go to think things through. I thought this landscape looked as though it could serve as a secret place. 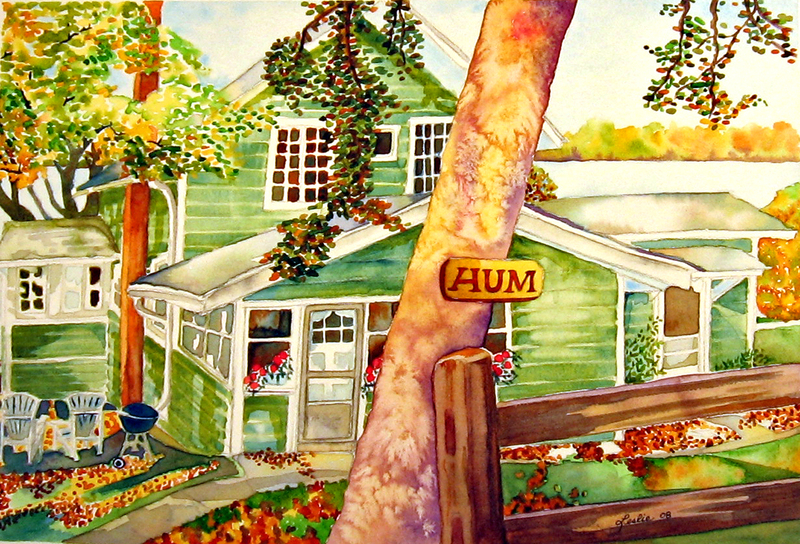 What I worked on with this painting was trying to subdue my greens. I was happier with this than most of my greens. I used olive green, oxide of chromium and transparent yellow as well as some raw sienna for the leaves and grass and moss. I follow a site titled Big Sur Kate. Late last summer she posted the above photograph. I commented on all the beautiful color and that it was so surreal and different. I have followed her photography because I saw, early on, that she incorporated a knack for great and interesting composition in her work. She was kind enough to offer this image for me to work from. Little did I realise how difficult it would be for me to reproduce in watercolor. The following are my attempts to paint this beautiful seascape. This is my first attempt. I didn’t like all the hard edges and did not feel I had enough definition in the clouds. I liked the brightness it captured but the darks were not deep enough and I couldn’t get the sea darker without disturbing the first layer of pigment. This was my second attempt. I liked this much better but felt it lacked shape in the clouds.I liked the darks and the variation of color that was achieved, here. 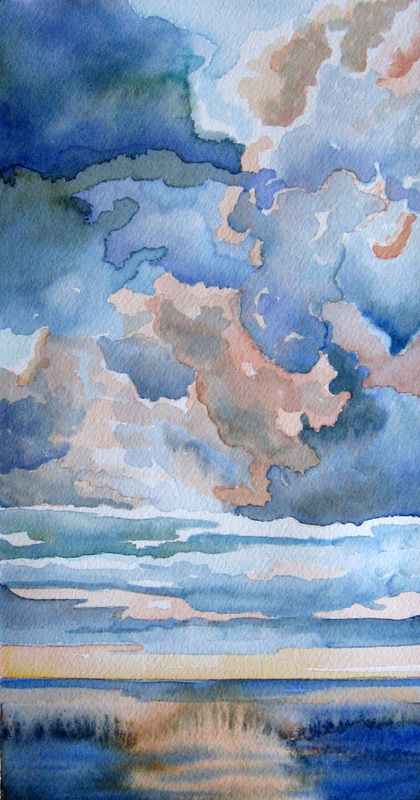 This one approached the bright light I wanted in the upper portion of the sky and I liked the shapes in the sea but was still dissatified with the shapes I was achieving in the clouds. I was getting closer to the color I wanted.I liked the somewhat v shape of the underside of the clouds I got in this one and how it defined the streaks of reflected light on the water. 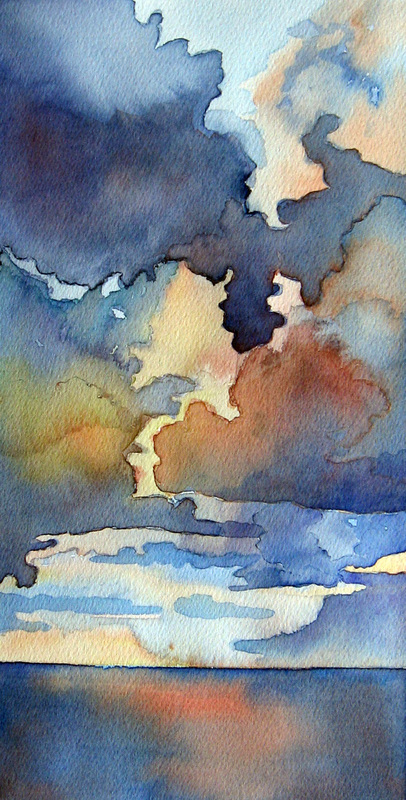 It was here that I decided to change my approach and paint shapes in sections to define the clouds I wanted to achieve. I also decided I wanted to go with the essence of this v shape to create the next one. This was my final attempt and I am pleased with it. The Fabriano coldpress allowed me to play in the pigment a little more. It would allow me to lift hard edges and re-design an area. It also offered a surface that I could lay down abstract shapes with ease. I also pulled out the titanium white and enhanced portions of the clouds to gray out some areas and brighten the whites of the clouds on the top. This entire venture made me appreciate the art of photography much more than I ever have. 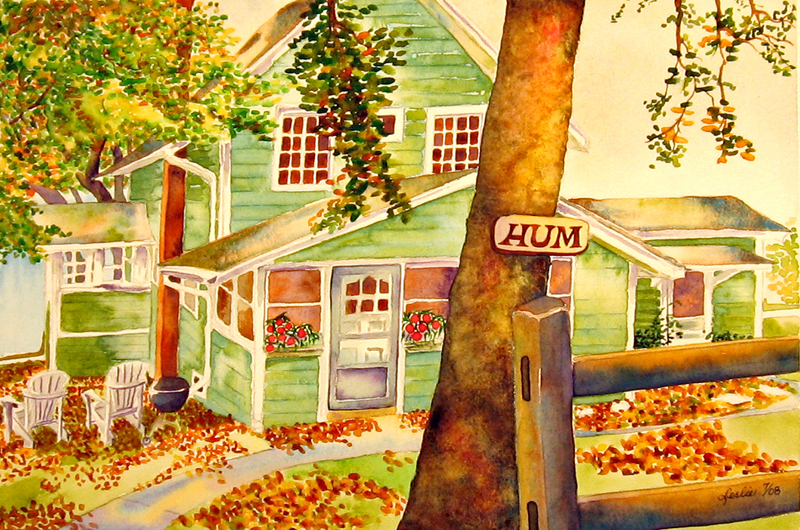 There are just some things that are captured with a camera that we would not have if we had to paint it FAST! before it disappeared. 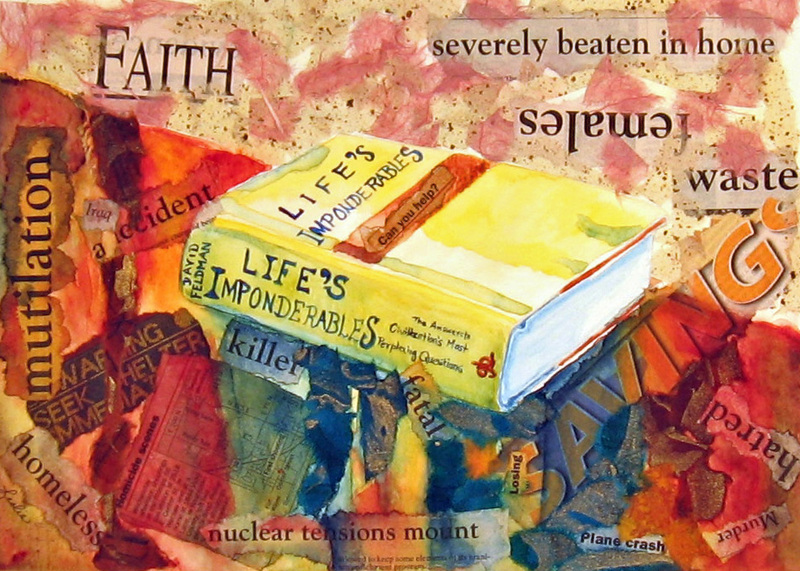 Thank-you, Kate, for sharing your art with me so I could learn valuable lessons here. Carol King worked with a similar vertical tree trunk and handled it beautifully here.